Deadly Class #36 sees a return of the unabashed violent story of an ‘80s malcontent street kid trying to survive his educational experience at Kings Dominion Atelier of the Deadly Arts, a school for the training of assassins. Marcus Arguello was a rat, a student with no lineage, a street urchin drug out of the gutters of San Francisco to study the finer arts of assassination and killing. Marcus thought he finally found a place he belonged. Marcus thought he had finally found love. Most importantly Marcus thought he had found a family. Marcus was wrong since Marcus never truly understood his place at Kings Dominion, the purpose that he and his fellow rats really were, that they were the prey for the first year students final exam. What Kings Dominion didn’t know was that Marcus is a survivor. Against all odds Marcus survives and even as everything in his life falls apart Marcus always stands back up and takes whatever is front of him head on. Deadly Class #36 is a trip. Literally. Deadly Class #36 takes the reader through the inner depths of Marcus’ psyche, which would already be a disturbing event with Marcus’ life as a child and a teen, but the experience is magnified with peyote. After the events of the last arc, which saw Marcus and his girlfriend Maria, located in a small seaside Mexican village by both the Yakuza and students from Kings Dominion, some to aid him while others to kill him. 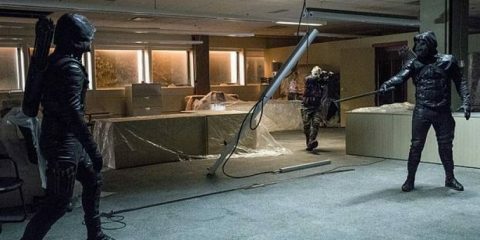 In one of the bloodiest arcs in the history of the series saw the body count rise and no one walked away from the showdown mentally or physically healthy. To regroup Marcus and his friends (old & new) have retreated to the desert, to a Reservation, and have embarked on a vision quest. It’s through this quest that we visit Marcus’ past, and the twisted reality that has been his life. We also see Marcus’ hope, the life he longs for but knows he can never have. The vision quest also brings him to a shocking conclusion that makes no sense and perfect sense at the same time. Rick Remender and Wes Craig have created a modern subversive masterpiece in Deadly Class. Remender pours his soul into the scripts. Even with the fabricated and over the top violence of the story Deadly Class feels personal, full of emotion and heart. Wes Craig’s art is amazing, with original layouts and pages that flow perfectly into the next. His range of art is incredible as he can shift his style to suit the story, as this issue shows with its trippy, psychedelic art that truly compliments Remender’s story. These two creators are at their best on Deadly Class and I hope the book goes on forever. 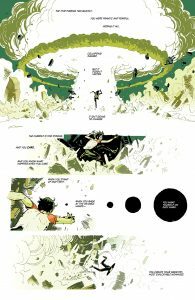 Verdict: Deadly Class #36 is a trippy psychedelic ride into the mind of Marcus Arguello, the main protagonist of Deadly Class. 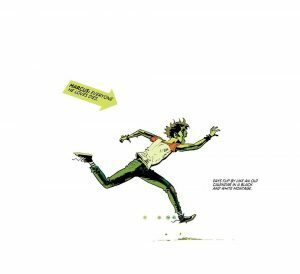 Remnder and Craig reviews the story so far in a truly unique way that completely complements the story so far and Deadly Class #36 is a Buyfor fans both old and new.